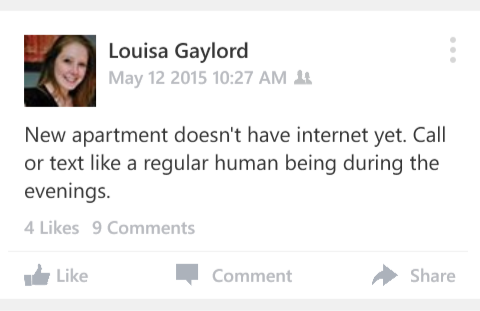 Recently, I stumbled across an old Facebook post from May that said: “New apartment doesn’t have internet yet. Call or text like a regular human being during the evenings.” Well, eight months later and my apartment still doesn’t have internet. And that’s okay. I’m not using this as an excuse why I haven’t updated in a while. I still use the internet every day, mostly for work. But there is no more daily Netflix in my life, no mindless surfing the web or drunken Amazon impulse buys. I don’t think I’m better or more “authentic” than others. I just think the responses I get from people when they find out says a lot about our always-connected culture, especially in the tech Mecca of Seattle. My programmer friends can’t wrap their heads around why I would choose to live without internet. There are several reasons, the first one being that I am lazy. Like, super lazy – but only when it comes to dealing with paperwork and billing and setup. If I don’t have to go through the process of choosing a provider – the lesser of the customer-service evils – then I’m not going to force myself. This is the same laziness that tells me that instead of looking up the bus schedule and waiting patiently, I should just walk. If there’s an emergency, or I need to look up directions (I suffer from self-diagnosed geographical disabilities), my apartment lobby is connected. The second reason is that, having grown up as an only child and worked in a bookstore, I love to read and create things. My ability to read in the backseat of a moving car comes in handy more frequently than you’d think. Just last year, I read 52 books in 8 months just to prove that I could. Every year, my family used to make a photo collage to send out for a holiday-neutral New Year’s card. This wasn’t done by computer, these were done by hand with actual photo prints, X-Acto knives and glue. This isn’t a “way back when” scenario, we made these collages up until 2011. 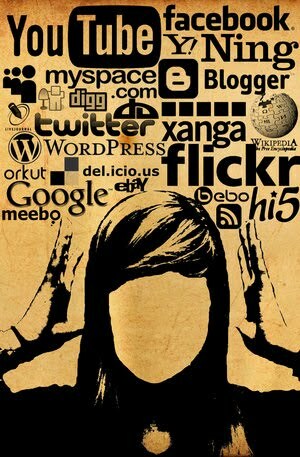 The third reason that I don’t have internet is that I don’t feel the need to be connected all the time. I don’t have my work email sent to my phone because when I leave for the day, I’m officially off the clock until the next morning. I’m exploring my friends’ movie collections instead of Netflix, and I don’t find myself mindlessly scrolling through social media. It’s not that I’m computer illiterate – quite the opposite. But just because I can create layouts with InDesign and edit images in Photoshop doesn’t mean I’m not more comfortable doing it by hand with an X-Acto knife and a glue stick. I’ve found myself revisiting my distinction between “want” and “need” recently – a distinction that is responsible for me not eating meat (except seafood) for the past 10 years, and not getting my first car until I was almost 23. Just because I can be connected all the time doesn’t mean I should. I’m not using this as an excuse for not updating my blog in a while; that’s entirely on me. I don’t suppose many people have noticed my lack of recent material, but it’s a good writing outlet for me. The articles I write for The Museum of Flight are not entirely my intellectual property, as the final product has been edited by others, so I don’t want to take any chances. My friend Sara (Hey, girl!) made a 2016 resolution to update her food blog more often, and I’m going to follow her example. By day, I will continue to pursue my career of aerospace puns, donor proposals, annual reports and nonprofit writing. But in the coming months of 2016, this outlet will be more creative and self-reflective than it has been in the past. And somehow, I will manage to do this without internet in my apartment. 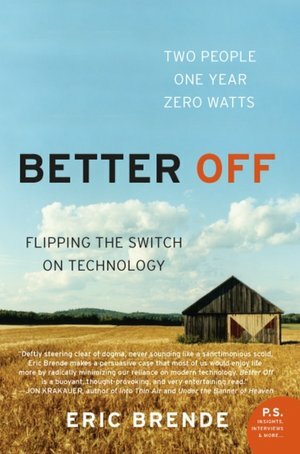 This entry was posted in Tech and Media and tagged Better Off, Eric Brende, Facebook, internet, Netflix. Bookmark the permalink.